Smell This! 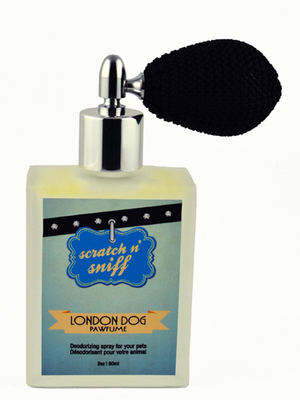 has created a new range of sumptuous pet-grooming products called “Scratch N Sniff”. The botanical-based line is chemical and paraben-free, and includes products such as London Dog Pawfume, Furrtastic Detangler & Shine, and a must-have natural insect repellent. The six “Scratch N Sniff” products promote cleansing and detangling furry coats as well as refreshing in-between washes, while the healing RRRRRx Repair Balm is great for hot spots, minor cuts and scratches. We created "Scratch N' Sniff" out of our own love for animals. When the production company for the movie ‘Marmaduke’ called to order our "SWAT natural insect repellent", we thought it was for the crew. Instead, it was for the main cast, which was made up of dogs! We recall thinking "Oh, those poor dogs are being bitten alive and our chemical-free insect repellent was their savior!" We love animals as much as we love humans and this story was the inspiration behind the “Scratch N Sniff” line. Celebrity fans of the pet line include Urban Rush, Fiona Forbes (the dry shampoo is named after her dog, Chewy). 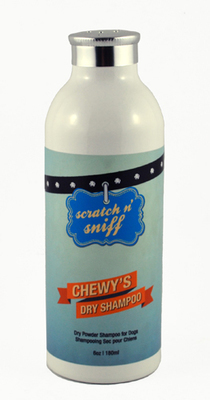 Proceeds from the sale of Chewy's Dry shampoo, are going to Fiona’s pet charity, the BC SPCA. These products are safe to use on pet owners too. Get your paws on some today!